From heartbreak to happiness, A Canine Companion centres around nineteen beautiful dogs and their remarkable stories of rescue. 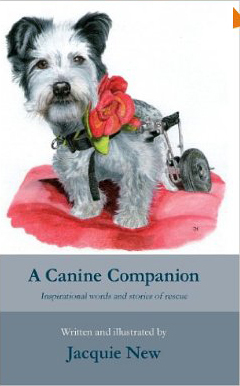 Written and illustrated by a dog lover and rescuer, these stories are passionately told, in a way that could only come from one who has experienced rescue first hand. A stunning fine art portrait alongside words of inspiration and poems about dogs and rescue, accompanies each heart-warming journey, making it the perfect gift for dog and animal lovers everywhere and their stories and portraits will stay with you long after the last page has been turned. Jacquie New is a Fine Artist, Author and animal rescuer and ‘A Canine Companion’ is her first book. Written and illustrated to help raise awareness and support for the charity: Little Angels Rescue BG. Her Fine Art work consists of anything animal related. Jacquie specialises in Pet Portraits have a look at some of her work on her website.